At the end of the previous session we discussed what we would be doing over the christmas period running up to hand in. Using Basecamp we set priorities in the form of to-dos some specified to individuals for example myself i had to blueprint pawn possession, or general to-dos for everybody like finish all building textures. This was made very clear before the holiday and the use of basecamp and communication was mentioned prior to that aswell as vital over the holiday period. This was evident due to basecamps tracking of log ins half the group didnt use the program at all and few used it regulary, this picked up when reminded but it should be a habit by now to be keeping well involved with all the work making sure your not missing one bit. That being said we reiterated it on return hoping for a collective group to be working professionally using the likes of basecamp on a regular basis. Over the holiday period most had to admit little had been done or more could have been done, I myself know i did do work but could have done more if I had only special occasions off. Despite that I have managed to texture 5 of my 6 buildings after finishing the parliament street building model with the last texture in progress , my blogs are current in the client. Since return I have modelled an interior for the classic mini, blueprinted Pawn possession (with assisstance from Phil for the exiting of the vehicle which took a while and 2 heads to figure out), and most recently to much joy I have managed to correctly rig, weight paint, animate and blueprint my mini to be driveable in engine. I will now elaborate on my process for each of these with images. As far as textures go most i have already uploaded so ill just show the most recent, which is a model im also yet to show. 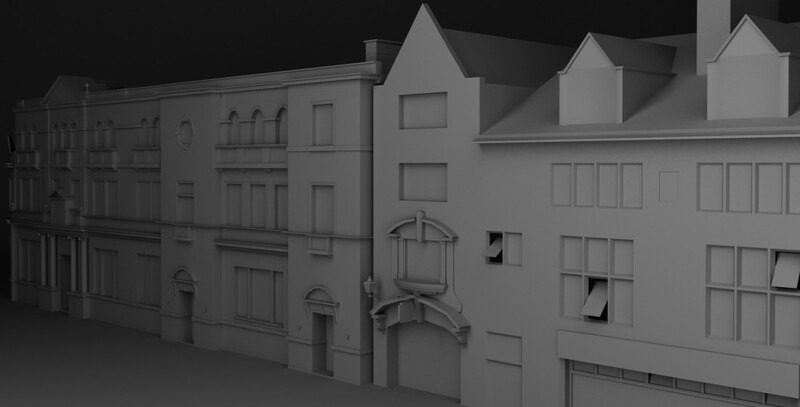 This is a building down parliament street, I chose it as I know modelling is one of my strong points so I felt a more difficult looking building would be better tasked to myself. I had some issues along the way despite that the making of the bottom half was the hardest part with the extruded sandy parts needing different sizes each time and to bend around the window. I am very pleased with my final product of the model and doing such a detailed building in 2781 polys when a high detail building was originally tasked at 20000, shows im getting better at modularity and having an eye for optimising my model. The texture i was very pleased with, I used simple planar mapping for most of the unwrap then just a few cases of needing to grab verticies to not have stretches around stiched corners and then just scaling so that the checker pattern created nice neat squares across each area. 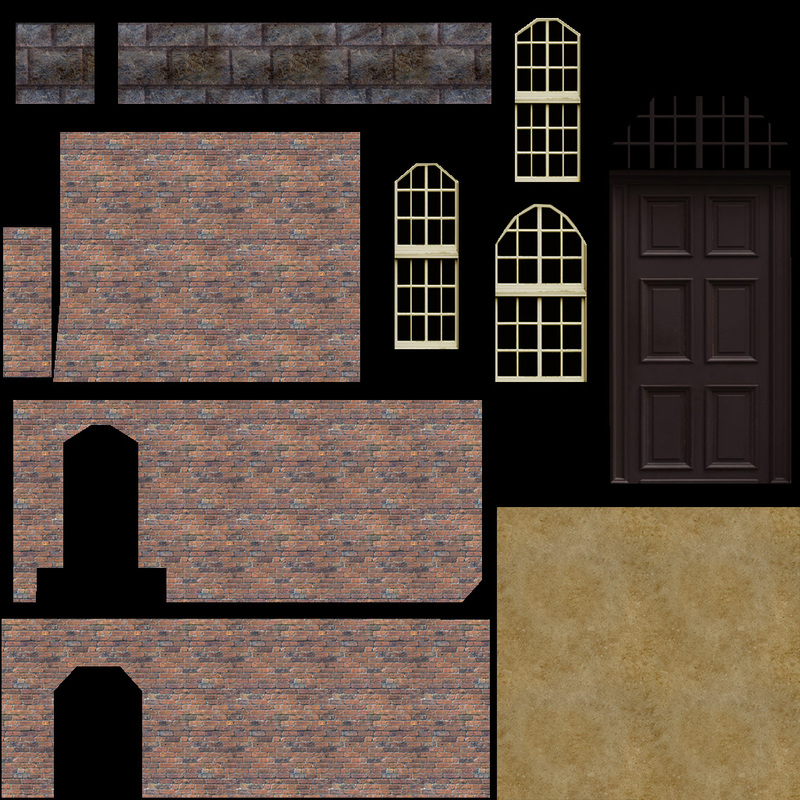 The changes i will make to this will be the bottom section, the stone part was a basic tileable stone texture that I have hand painted it to make it look like bricks, but after some digging a stone texture like that of the original building was found so its just needs applying. 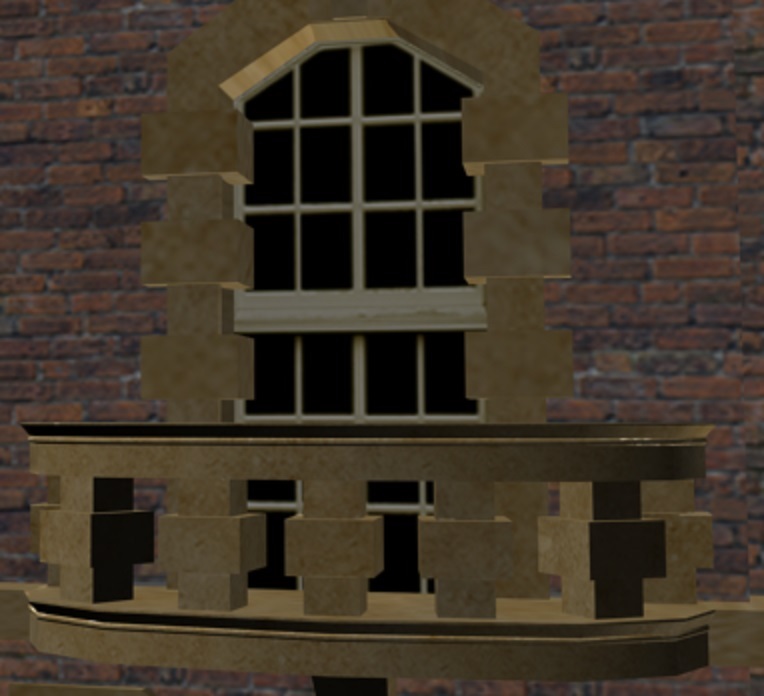 There is a slight issue with the bricks on the left window they skew a bit I wasnt sure on why this was at the time so i continued with the unwrap and when I textured it I forgot about that being left. This needs patching up once I find out why its done this but shouldnt be too much hassle hopefully. Next is to apply normal maps to my buildings to create more realistic textures. Moving on I modelled an interior for my classic mini using my own reference and just reference from classic mini online stores for accuracy. With this interior modelled we can now have the in car view for the classic mini not only for people walking past to see a interior but for the pawn possession feature we can drive this in first person view. Im really happy with my end result for the interior all that is left for the car now is to be textured. Im not sure ill have time for this before hand in but certainly will be a definate for the end product. Now to have all this used to its max I was tasked with the pawn possession feature for interactivity which would be done in blueprints. This is a slight alteration of my initial idea early on of a racing game due to the figure of 8 on the map but i wanted to be involved especially when they are my vehicles in the project. Being fairly efficient in blueprints this was a task i felt confident in completing using the help of online tutorials and ue4 answer hub. Now this was the case i had it all working then realised that we need to get out once we are in. This was proving more difficult as the player would spawn back at player start instead of outside the car. Also spawing the player inside the car in view for 3rd person example purposes made 2 collisions collide and send everything absolutely mental. With the addition help from Phil it took us most of the day but we finally figured out how to get them in and out of the car. After celebrating we then realised we can get out and in at anytime from anywhere. Simple fix of a radius overlap on collision enabling the key press to enter, then the exit the player could just bail tuck and roll at anytime like GTA. We didnt want this so again took time to work out how to calculate it to only be exitable when throttle is less than 1. This was completed by the end of the day and we now have a working pawn possession in our project to add to interactivity. But to make this our own personal touch rather than Unreal Engine 4’s preset sedan vehicle in our game which didnt match the 60s theme at all, I was then challenged with the unknown area of rigging a vehicle for it to then work in Ue4 with our pawn possession. Im going to be straight I did this process over and over so many times due to issues with bones, not weight painting it right, UE4 claiming un-weighted bones, wrong hierachy for the bones. And that was just 3DSMax issues, when i got all the max issues resolved I put it in UE4 for animation blueprints not to fire, car controls not to work, the car to have everything set up and stay stationary, physics assets not correctly set up, the sedan to be clashing with the custom vehicle blueprints and setting up the front and back wheel blueprints wrong having all wheels rotating manicly. It was a laugh but i can now say ive done it that many times through trail and error the process has been memorised and hopefully mastered for future use. It was such a relief to see car wheels spinning after hours of stress and frustration on why it all was going wrong for me. Persistance got me there and now im proud to have the vehicle able to be possessed and driveable. Additional animation will need to be taken into consideration due to the interior view like the steering wheel with hands, gear changes, dials etc but for now it works to a standard im pleased with for a rookie in the rigging area. Despite this lengthy process it was well worth me sticking to it, not only for end product for the client but this will also help me in my self initiated racing game. On reflection im pleased with the work that I have done but would have liked more done over the holidays to have a larger amount of especially assets to hand in. Due to the complexity of cars its not a botch quick job it takes time and with focusing on them in client and self initiated i think i need a break to rapidly produce smaller assets for the project. As for the hand in, Myself and Phil will be making the modular road system again due to some slight measurement miscalculations and then texturing that ready for hand in. Hopefully we will have a collective textured section of our project which is the primary target. We already covered the interactivity side with a treasure hunt, involving pick ups, inventory system, gate and key system, driveable car (pawn possession), throwable object projectiles, and then a basic HUD with minimap and inventory system. My contribution to this was the pawn possession due to my main skillsets being in modelling and Phil taking the lead on the blueprints side of things. Hopefully everybody does manage to get everything tasked on basecamp done within prioritising so buildings modelled and textured the priority then all the rest being added bonus. I look forward to our feedback as i know we should be alot further ahead and hopefully the group steps up to really get the best out of our client piece for the final product. EDIT: I have now resolve the brick skewing issue it was a mistake on my behalf aligning some verticies horizontally that shouldnt have been, really simple fix thankfully. Categories: Client Project, Year 2 | Tags: 1960s, 3D, 3D Model, art, Client, Design, Design Process, Environment, Gameplay, Interactivity, PHASEgaming, progress, Project, texture, Video game | Permalink. Current student at Hull School of Art and Design studying Games Design.